If you think of your eye as a camera, the eye has two lenses (Cornea, Lens), a camera film at the back (Retina) with a jelly filling the eye in-between (Vitreous). In structural terms, think of your retina as wallpaper lining the inside of the eye. 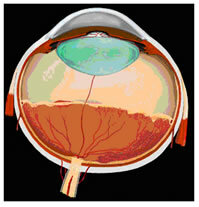 In functional terms, think of your retina as a soccer pitch with a centre spot where the kick off is taken from. The eye has a centre spot called the macula that is responsible for your eyes ability to see colours, recognise faces, and read. The remainder of the retina near the sidelines, corner flags and goal posts is only responsible for movement vision. Before birth the blood vessels that nourish the retina grow forwards from the back part of the eye- a process known as retinal vascularisation. This process is incomplete when a baby is born prematurely. The changes that can take place at the junction between the back vascularised and front non-vascularised part are known as retinopathy of prematurity(ROP). Survival rates for premature babies have increased significantly over the last 40 years, from about 5% to 65% for babies with birthweight less than 1000g and from about 35% to 90% between 1000g and 1500g birthweight. Consequent upon this improved survival, the number of babies with ROP has risen. Although the number of infants blinded by ROP is fortunately relatively small, this represents a great number of years of disability, which in many cases is unnecessary. About 6,600 infants of birthweight <1500g are born in the UK each year with a survival rate of 80% (5,280) and an incidence of severe ROP of approximately 8% to 10% (about 450 infants. Of the 450 infants a proportion will be at high risk of blindness. 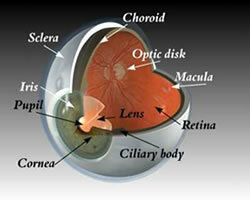 Laser treatment of the front part of the diseased retina can prevent this. A small proportion of babies despite this treatment can go blind from detached retina. I specialise in surgery for detached retina (Vitrectomy or scleral buckling) and am trying to develop an NHS service provision in this area. This type of surgery is controversial with some physicians remaining cautious about its role. The funding of surgery for advanced ROP disease has to be negotiated centrally with the government. However to increase the level of expertise in Oxford for ROP and other paeditric retinal surgical disorders I have put together a "paediatric retina fund" in collaboration with Oxford University. Its role is to fund an infrastructure to promote research and clinical provision of paediatric retinal surgery for local patients and those referred to me from other centres. In collaboration with other funding bodies such as the Oxford eye hospital trust fund, Paediatric Charitable funds it has been possible to purchase RETCAM which is used to photograph the retina of infants with a range of disorders including ROP, shaken baby injury and cancer of the retina. ( http://www.massie-labs.com/). Further projects include upgrading a paediatric retinal scanner and investing in wide field imaging techniques. "Paediatric retina fund: HM7460 Patel Research Account"